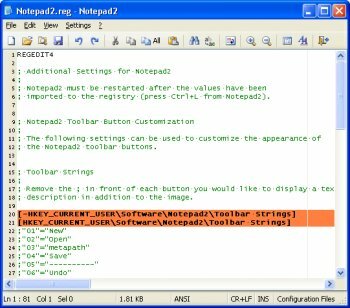 Notepad2 is another small, fast notepad replacement with some unusual features. It includes zoom, rectangular selection, regular expressions, and more. I don't care for this all that much. Akelpad is more user friendly for me though that mod version works well with nfo's. While I do use this editor, it's certainly not my primary editor. And comparing Notepad2 to UltraEdit32 is one of the most ludicrous statements I've ever read. The second-most ludicrous would be comparing to Notepad++ - which is a great feature-rich editor, that may or may not crash for no reason whatsoever. From VAX to Unix to DOS to Windows and Linux, I've used dozens upon dozens of Editors, and Notepad++ is the only one (of two) that has crashed. Notepad2 is a decent 'quick-edit' feature-light editor that has a few annoying quirks that the dev doesn't want to fix, but at least it has never crashed. If you require heavy-lifting and extensive customization, you should look elsewhere. And if stability isn't important to you, but free is, go for Notepad++. My full-featured editors of choice, EmEditor, and CodeLobster PHP. Notepad-like editors: Notepad2, Ted's Notepad (v6 beta), and good-old Notepad. For ~$40 EmEditor (perpetual license, so far) stomps all over (feature-wise) the outrageously priced UltraEdit32, and the "free" Notepad++. Unless you are hooked on tabs, this is the notepad to have. Lightening fast. Outstanding. I've been using this more and more instead of UltraEdit simply because it launches so much faster, and has fewer annoying bugs. It doesn't have the nifty macro features but not being aggravated is very high on my "List of Important Things". I have to agree with the other reviewers here. Best notepad for Windows replacement. Like notepad, it is small, fast, and light but also portable. I too have replacled the native notepad app with this on all my Windows boxes and keep it handy on my USB flash drive. This and foobar are just two of a very small set of apps that I consider must haves for every windows user. I am torn between this and Notepad ++ They are both great and I couldn't see getting by without one or the other on a daily basis. I've replaced the native notepad.exe files with Notepad2, after renaming the latter's file to match (using WfpDeprotect, an awesome console app available from bitsum.com). Great replacement for all the aforementioned reasons. @dhry: Unfortunately Kai Liu hasn't updated his builds for quite some time now. Nevertheless, I agree Notepad2 is the best notepad replacement. Small and does what it has to very nicely. If only Florian Balmer would use the installer Kai Liu has made. That would made things a lot easier for a lot of people. Absolutely brilliant. Loads in a flash, lots of great options, rock solid and has never crashed for me. And not as many bugs as Notepad++. God I hope the author doesn't turn it into bloatware. I hereby designate this an honorary Fileforum Pick. Awesome stuff. Standing by for the code-folding build.